ISLAMABAD (AP) — Pakistan and India have agreed to stop trading fire, including artillery and small weapons, along the highly militarized frontier in the disputed Himalayan region of Kashmir and uphold a cease-fire accord dating back 15 years. After months of routine skirmishes that have killed dozens of soldiers and civilians on both sides, the situation was calm on Wednesday. Pakistan's military said late Tuesday that local generals reached the understanding using a special hotline set up to defuse tensions in Kashmir, which is split between Indian and Pakistani zones of control. Both nuclear-armed powers claim Kashmir in its entirety, and the territorial dispute has ignited two wars between Pakistan and India since they gained independence in 1947. Both sides "agreed to undertake sincere measures to improve the existing situation, ensuring peace and avoidance of hardships to the civilians along the borders," the Pakistani military said in a statement. It said that if future violence occurs in the disputed region, "restraint will be exercised and the matter will be resolved through utilization of existing mechanisms of hotline contacts and border flag meetings at local commander's level." The Indian army confirmed the agreement and issued the same statement. The two sides also agreed to fully implement a 2003 cease-fire that has been repeatedly violated. Tensions have soared in recent weeks, as both sides have shelled border posts and villages and used automatic fire along the highly militarized frontier. Each side has accused the other of starting the hostilities in violation of the 2003 accord. This year, the situation worsened as the rivals also fired artillery shells at each other's positions. The soldiers from the two sides have engaged in fierce border skirmishes along the rugged and mountainous Line of Control which divides Kashmir territory between the two nations, as well as a lower-altitude 200-kilometer (125-mile) boundary separating Indian-controlled Kashmir and the Pakistani province of Punjab, where most of the latest fighting occurred. On the Indian side, the fighting has driven people from villages along the border, and government buildings have been converted into temporary shelters. Houses have been damaged, and dozens of schools in villages along the frontier have been closed, with authorities advising residents to stay indoors. 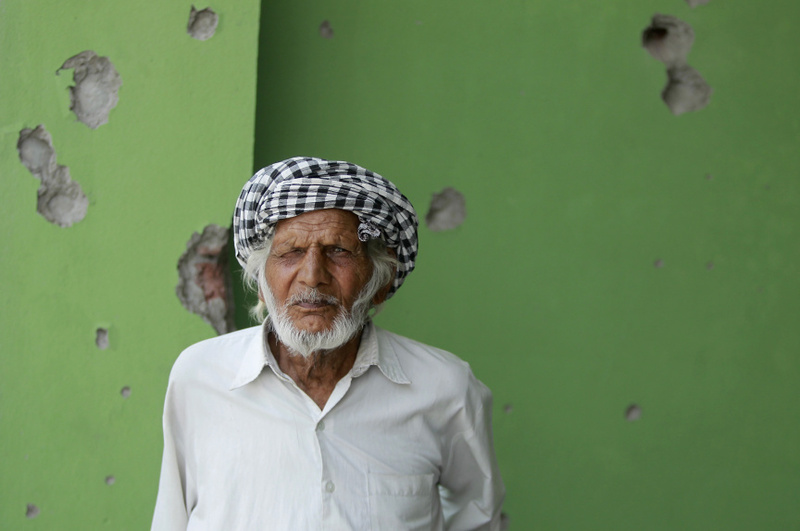 The shelling has cast a pall over the holy month of Ramadan in the mostly Muslim region. The shelling typically flares up in the pre-dawn hours, when families are having a meal known as "suhoor" ahead of the daytime fast. India says 25 civilians and 18 soldiers have been killed this year in over 800 cease-fire violations initiated by Pakistan. Pakistan accuses Indian forces of more than 1,050 cease-fire violations this year, resulting in the deaths of 28 civilians and injuries to 117 others. Senior officials at the foreign ministry in Islamabad said Wednesday that Pakistan sees peace talks and negotiations as the only way to resolve all issues between the two sides. The officials, who spoke on condition of anonymity to talk to reporters, insisted that Pakistani troops never deliberately target civilians on the Indian side but only respond to Indian fire in Kashmir. Sheikh Abdul Qayoom, an analyst based in Srinagar, on the Indian side, said the latest cease-fire is unlikely to hold unless the two countries come to a broader agreement on Kashmir, something that has eluded them for decades. "India and Pakistan have always agreed to cease fire after a cycle of violence, but that in itself has been a sporadic thing, it has been an episodic peace between these two countries, then they return back to violence," he said. Residents on both side of the Line of Control nevertheless welcomed the announcement and expressed hope the peace would hold. "This is exactly what people on both sides want, peace is the desire of all people," said Tariq Mir, a businessman living on the Pakistani side. Sharafat Hussain, a lawyer in Muzaffarabad, the capital of Pakistani-controlled Kashmir, said both sides should adhere to the cease-fire. "They should look to resolving problems through dialogue, as gunfire is not the solution." Sahil Nazir, a resident of Srinagar, said the latest cease-fire was a "good announcement" that must be implemented on the ground. "Guns should be silenced on both sides and borders should stay calm."